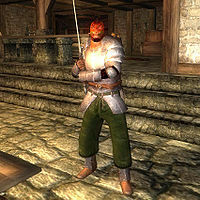 Ah-Malz is an Argonian blademaster who can usually be found at the Skingrad Fighters Guild Hall. He wakes up every morning at 6am and spends the next 4 hours standing beside his bed. At 10am, he leaves the Guild for a walk down to the chapel and returns at noon to eat lunch with the other guild members. At 2pm, he heads down into the guild basement for a 4 hour sparring session against fellow guildmember and goblin hunter Parwen, after which he eats his dinner upstairs for 2 hours. From 8pm, he will stand close to wherever he eats dinner until finally going to bed at midnight. During the day he is clad in heavy armor consisting of iron boots, gauntlets, and a cuirass. In the evening, he will change into something more casual: a dark green shirt and green felt linens. He also carries a steel claymore and a small amount of gold. His favorite pastime is no different than his fellow Fighters Guild members: hunting goblins. His introduction makes that clear: "Ah-Malz of the Fighters Guild. Welcome to Skingrad County. Come hunting goblins, have you?" When asked about Skingrad, he'll tell you about them: "The whole West Weald is pretty good goblin hunting country. They're thick here in Colovia, along the Valenwood and Elsweyr borders." After this conversation you can select the "Goblin Hunting" dialogue option, at which point he'll mark Derelict Mine on your map: "Try the big goblin den called 'Derelict Mine' out east along the Gold Road." His hatred towards goblins hasn't gone unnoticed in Skingrad. The citizens will tell you that "Ah-Malz at the Fighters Guild has gotten to be an expert on goblin hunting. He just hates the things." and "I heard Ah-Mahlz [sic] was out hunting goblins again. Good. They're vermin." His sparring with Parwen seems to spill over into friendly competition, too: "Parwen has really got a thing for goblins. I think she and Ah-Malz keep a running tally of who has killed more." Ah-Malz stands around doing nothing from 6am to 10am, and from 8pm to midnight because his AI package is set up as a "Travel" rather than a "Wander". Since he is already in the Fighters Guild, he ends up doing nothing. Esta página foi modificada pela última vez à(s) 20h33min de 9 de novembro de 2011.